Patients who have lost massive amounts of weight, either as a result of dieting or bariatric surgery (gastric banding or gastric sleeve), may have enormous amounts and folds of redundant skin. Body contouring after massive weight loss or bariatric surgery. Once the skin has been stretched beyond a certain limit - it will be irreversibly damaged. This is when stretch marks appear. After this the elastic recoil of the skin is reduced such that it will not redrape with loss of weight. The excessive floppy tissue which remains after massive weight loss in the inner thighs can be removed with a thigh lift. This tissue will create a fullness in clothing, and may become excoriated with certain activities. Rashes may develop in this area, particularly in the summer months. The excess skin can be tightened with a procedure which places either a horizontal or a vertical incision in the inner thigh. A precise amount of fat and skin is then excised. The adjacent skin is undermined and re draped. This restores a normal tone to the skin in this area. People who have been successful in losing a massive amount of weight are often left disappointed with the apron of excessive skin which remains around their waists. This tissue can be both on the front as well as around the back. The “belt” or circumferential lipectomy can remove all of this excessive tissue, both front and back. The first part of the operation is essentially the same as an abdominoplasty. After the abdominoplasty is completed, the attention is turned to the back. The second part of the procedure can follow immediately, or can be performed at a later date as a staged operation. The patient is turned onto their front and the ends of the original wound (on the front) are extended so that the final wound runs around the entire body. The skin edges are undermined and the skin is redraped after a suitably sized wedge of skin and fat is excised. The post operative course is similar to that described for the abdominoplasty. In some situations an abdominoplasty may not be appropriate and an alternative procedure is an apronectomy. This procedure is the simple removal of the excess abdominal skin which forms the overhanging abdominal apron. The surgery involves less undermining of the anterior abdominal wall. Classically the umbilicus is not moved. The simple excess skin and subcutaneous fat from the abdominal apron is removed and the wound is closed. This generates less potential dead space and therefore less potential collections of serious fluid (seroma) or blood (haematoma). This is a good operation for patients who have lost a significant amount of weight but whose Body Mass Index (BMI) is still elevated above the normal range (18.5 – 25). 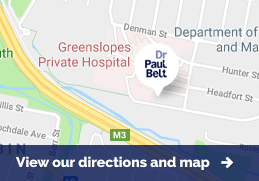 Dr. Belt is happy to assess you and advise you which procedure would be ideal for you.